is honored on Panel 34E, Line 15 of the Vietnam Veterans Memorial. The war may be forgotten but the warrior will always be remembered. All gave Some-Some gave All. Rest in peace Thomas. 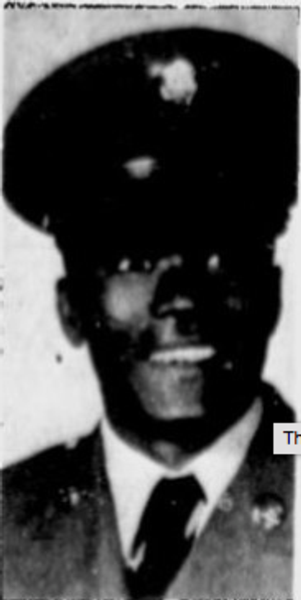 Specialist Four Thomas Carpenter Jr., Served with the 615th Transportation Detachment, 57th Assault Helicopter Company, 52nd Aviation Battalion, 17th Aviation Group, 1st Aviation Brigade, United States Army Vietnam. Thank you for your service as a Huey, UH-1 Helicopter Repairer. It is important for us all to acknowledge the sacrifices of those like you who answered our nation's call. Please watch over America, it stills needs your strength, courage and faithfulness. Rest in peace with the angels. I was the last person to see him alive on the night he became a casualty. we were a two man team working together on the night shift that was started to handle a back log of helicopters in maintenance. He sat a top our bird, straddling a rotor blade to service it. I was on the engine deck below and a shorter drop to the ground, which probably helped save me when the suicide squad of vc sappers attacked. For years I have deeply regretted not having any contact info for his family especially his mother to visit and console her. His trademark greeting was "give the drummer some" when he entered the hooch. Us guys would answer "you got it drummer!" And so Sp4 Thomas, my friend "you got it" You got my lifelong enduring memory of you. An aching regret over what happened to you. u got my highest respect and I honor you.